Session 400. There wasn't much wind but I was keen to have a go, but even with my big kite and the Nugget I was struggling. The run out seemed OK but coming back in the wind seemed even lighter. I headed in over the reef wishing I was wearing my reef booties. Eventually I body dragged with one hand on the board just above the reef, dropped the kite and packed up. Session 399. A short session after work. I was keen to use my foil board but there wasn't enough time to set it up. The wind was light at 15 knots but my Flite 14.5 and North Nugget board combined for another nice session. You need to keep in eye out for the wind dropping off to avoid getting stranded offshore. Session 398. There was around 20 knots and no kites out at Hampton around noon, . The wind picked up and some dark clouds were visible out over the bay. I waited a while for things to settle then setup my Union 8 and headed out. Anthony was on the water too. Great wind, really solid and not too gusty. I headed down to Green Point and caught some waves there over the reef. The wind was really good so I kited back to Hampton. Stuart W had just arrived. I got my downwinder gear (backpack, phone, money and travel card) then headed off. First big downwinder of summer! It brought back lots of great memories. I caught a few more waves at Green Point and the reefs of Brighton then kept going. I made it past the Brighton Marina breakwater passing close then enjoyed some very fast kiting on the big swells past Elwood. The huge cruise ship at Port Melbourne provided a good sight marker to head for. There was nobody else around. A downwinder provides meditation - the racing board, the powered kite, the bay swells and the views. From Port Melbourne I kited back to St Kilda and did a run it the Kiddies Pool before landing and having and calling in to The Zu Boardsports. 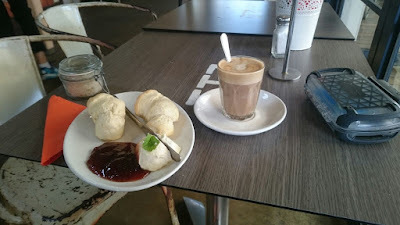 Devonshire Tea went down well at the West Beach Pavilion, then I walked to Fitzroy St and caught the 96 tram to Spencer St then the Sandringham line train back to Hampton. 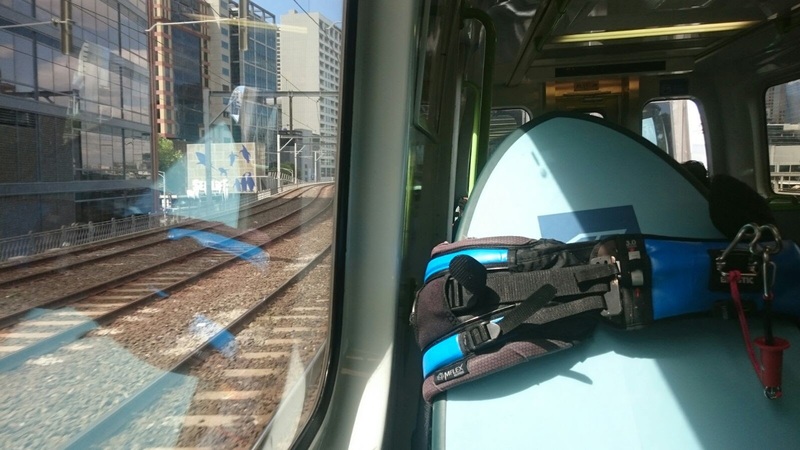 Wearing a wetsuit and carrying my board attracted the usual attention from others. Downwinders are always a highlight, particularly when the wind is so good. Session 397. There wasn't much wind when I headed out on my Ocean Rodeo 14.5 and the Wainman Passport board. I did one run out but on the way back I couldn't stay upwind so I came in at Brighton. Anthony had watched me head out (as the wind test dummy) and drove down to pick me up which saved me the walk back to Hampton. The Wainman Passport feels nice but I could't really put it through its paces.